I discovered delegates while working in C#, which supports them natively. Unfortunately, C++ doesn't handle them so elegantly. Basically, sometimes it would be nice to "subscribe" to certain events or messages in a system. For example, it might be nice to get a callback when a particular object is destroyed so you can clean up any references you have to it. I ran into this particular problem when I had an "enemy" object holding a pointer to the "player" object - this caused a crash when the player died and their object was destroyed. There are ways to handle this, though most of them are inelegant or require the object generating the event to know more about the receiver than we would like (say, a common base class that the receivers can derive from). This is also fairly straightforward if you just want to call a static function, but what if you want to call a member function? The main problem is that C++ just really doesn't let you easily create a collection of completely unrelated types, and pointers to member functions in unrelated classes are basically completely unrelated. C# handles this quite nicely by declaring a delegate - basically, a prototype for the callback function - and storing references to the object/function in a list. When you "call" the list of functions, every object/function in the list receives the callback with the arguments you provide. There are a lot of attempts to do this in C++. C++11 may improve things. I just went and rolled my own, taking ideas from here and there and trying to keep the code as simple as possible. It involves a few macros to wrap some complexity, but seems to work. You know how I said that adding anything with overridden operators to the expression parser would be pretty easy? Actually, it's ridiculously easy. I just added std::string as a basic type, and it took a whole 5 minutes. Anyway, I'm going to bind UI controls to C++ code via expressions. The variable scoping rules mean I can bind an expression to a specific object/component and basically manipulate it directly. I really need to get function calling working for button events. I can parse the argument list easily enough, I just haven't figured out exactly how I want to bind it to C++ code yet. I've been inching closer to getting going on actual level design for days now, and there always seems to be something else to do. Actually, that's not entirely true: every time I try to get started on actual level design, there doesn't seem to be any way to design a level. Clearly, I need a level editor. I had written a bunch of UI controls a while back. They have kind of been disabled in the switch to the component system, so today has mostly been resurrecting that system and integrating it with the component system. I was going to need GUI stuff again at some point, might as well do it now. Making the switch was actually fairly easy. All of the base types can be constructed from attribute files. Maybe I can have something working by the end of the weekend. One is a pretty typical particle system, it just emits and renders mostly ballistic sprite particles, for explosions or smoke, that sort of thing. The other is really more of a batch model-rendering system - it takes a single model and spawns multiple rigid bodies, so it has a physical presence in the physics simulation - good for bullets, swarms, that sort of thing. So, what if you have a bullet, and you want a small explosion when it hits something? I put together a sort of mediation component that waits for notifications from the physics particle system that a particle is being destroyed, and then it emits a particle on a an explosion particle system. Which is fine, except now I have a cSpawnParticleOnPhysicsCollideComponent class, which is getting a bit wordy. There's also a cSpawnParticleOnPhysicsTimeoutComponent class. It also doesn't trigger any audio yet. This is going to grow out of control quickly, seems like it needs a rethink. Under a maximum acceleration, how do we turn to face a particular direction as quickly as possible without overshooting the target? So, you want to start turning in a particular direction, then slow down and come to a stop directly facing your target. I'm assuming that your target is stationary, otherwise this gets complicated. 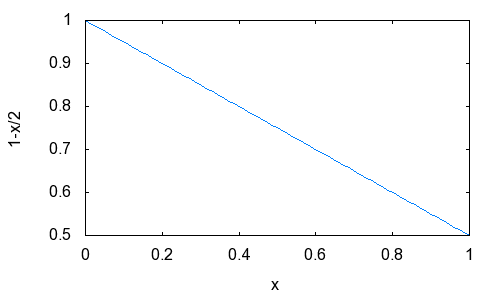 where the y-axis is your current speed, x-axis is the amount of time it will take you to stop, and the area under the curve is the distance you will travel. 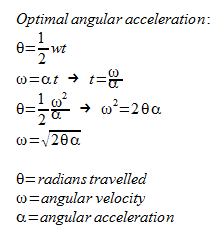 If you are on the line, you just need to decelerate at the maximum rate, and when you hit zero angular velocity, you should be facing the right direction. If you are below the line, you basically want to get to the line as quickly as possible. So what do we need to calculate? 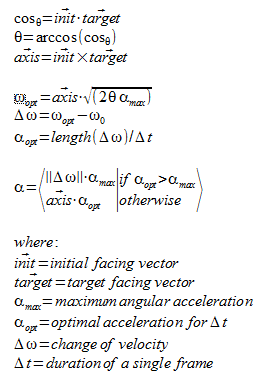 All of the math looks very similar for doing the same thing with linear acceleration. So, yesterday's successful memory cleanup was mostly motivated by the observation that, according to the Task Manager, my game was leaking memory at about 70K per second. I was expecting to find it was my fault, but now that there are no memory leaks... it's still happening! So, on to more data gathering. Using HeapWalk, and dumping the entire contents of memory every frame, I discovered that... well, there's definitely a leak, but it's not one of the game allocations. First, I pause the game, so there is nothing happening during Update, and we're only Rendering the same frame over and over again. 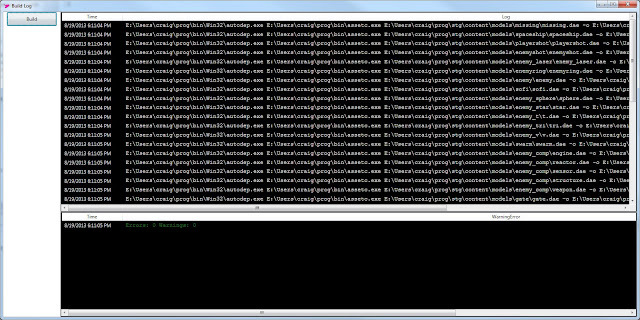 Then, I put a breakpoint in HeapAlloc (the base level Windows allocator that everything else eventually calls). And finally I notice some allocations happening from my file monitor, which is a really handy class that I set up that stores a list of files, their last-modified times, and a callback function pointer. Once each frame, I check to see if any of the files were modified, and if they were, trigger the callback. This makes live asset changes really easy. Apparently, in one case, I was not calling FindClose after calling FindFirstFile to check the current file time. Fixed this, and my memory usage is nice and stable. Yay, no more sucking up all available memory if I leave the game running for a few hours! I can shut down cleanly with no memory leaks! Whoo! OK, not that big a deal... well, unless you've ever tried to make your game do it, and then maybe you can appreciated it. :) At least, it's the most I can mange through the fog of whatever it is that's ailing me. I'm only using the aligned versions - it makes things a lot easier to just have everything 16-byte aligned (required for SIMD instructions and occasionally other things). Most allocations where this would make any difference at all go into a container or block allocator anyway. In any case, these functions have one fairly nifty feature: _crtBreakAlloc. When you exit your game, you will get a list of memory allocations that haven't been cleaned up, along with an allocation number associated with each one (and hopefully the file and line where the allocation happened). So, if the 1065th allocation was not released, single-step to start the game again, put _crtBreakAlloc in a watch window, set it to 1065, and continue to run the game. When the 1065th allocation happens, you will get a break, and hopefully you can figure out why that particular allocation was not released. This technique doesn't work once you have allocations happening in a non-deterministic order - say, after user input or random number generation - but for testing purposes it should be possible to work around those. Sick day - still fighting whatever it is I caught last week. Still, no rest for the sick-ed. Basically, this arrangement lets me draw the same game object multiple times and let it render its own HUD display. I have kind of been slacking on enforcing the points in bold, so going back to patch up some components so they don't draw on the wrong layers. All of this was to try and get the Health component to display a health bar above whatever it's attached to. Still working on that. I have this defined as extern rather than inline. That keeps the contents of System::AssertFail(...) out of the instruction cache unless the assert actually fails, which depending on the complexity of your ASSERT handler can be substantial. Have a good weekend, we'll see if I get a weekend edition out or not. Posting early today, non-work stuff going on that needs my attention this afternoon. Despite having some cough/cold thing going on, 1700 lines of code later we have a functional multi-type expression parser. There's still some function-calling functionality to add, but I can evaluate with proper operator precedence at least. I've written similar things before, but not supporting multiple types. Thanks to the hell magic of templates, anything that has overridden operators in C++ is pretty easy to add as a new type, though all of the permutations of <type1> <operator> <type2> are entered manually - I can't really think of any good way to get around that. Variables are bound from C++ and looked up by name, so we can directly read (or modify) values from the game. Currently there is just a single set of variables, but it should be pretty easy to allow multiple sets, so you could have something like a set of "global" variables, and then have some local to the game object or component the script is attached to. If you're not familiar with compilers, an l-value is, basically, the left side of an assignment operation, so you need to get the memory address to write to, not just the value. Hopefully I'll get this tied into the game in some useful way tonight. Today has been off to a slow start. 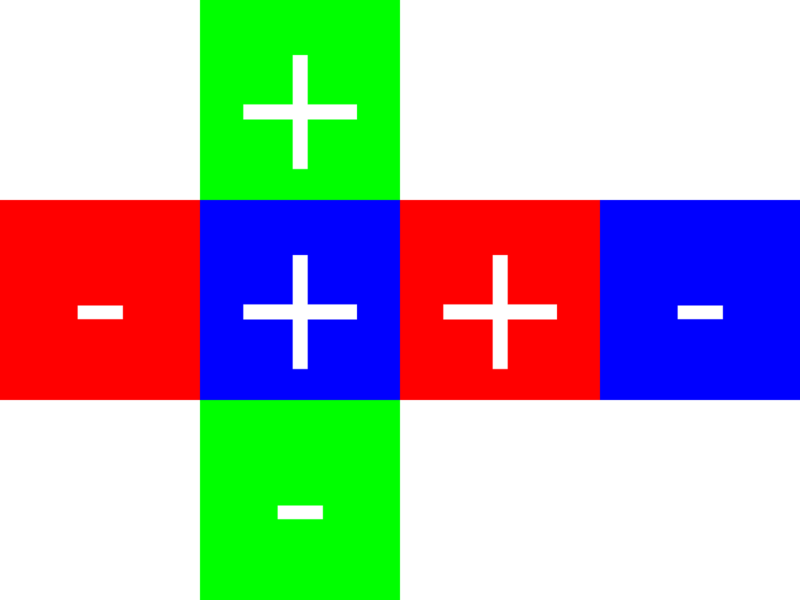 Mostly it has been reading a bunch of lighting papers and experimenting with an expression parser. Oh, and I made a RenderCubeComponent to complement the RenderSphereComponent from yesterday (settle down, let's not get too excited). I've been missing having a good expression parser, particularly with the heavily data-driven design I'm going with right now. I noticed that after doing all of the shader constant binding stuff yesterday that I need to specify that certain shader constants are bound to things that aren't actually constant (say, the camera View transform, for example). I was using Lua to do expression parsing type things, but... let's say I've fallen out of love with Lua. It's a cute language, but I found it was taking a lot of effort to bind everything to Lua, and ultimatley the lack of strict type checking meant that nothing ever worked the first time. Ever. With C++, if it compiles, at least you stand a fair chance of finding out you're an idiot before running the game it working. OK, the details are bit more complex than that, particularly when you're talking about multiple types, and especially if you want to do any sort of assignment operations. But basically, once you've built a whole tree of operations, you just do one function call, a bunch of virtual function calls happen, and you get a result. This can be expanded to execute a full language by making loop and flow control nodes as well - I'm not going to be doing that today. OK, I got my render-to-cube-map working. Apparently writing the comment "Save original transform" is not enough of a hint that I should "Restore original transform" once I'm done spinning the camera all over the place. In celebration, I give you a Test Cube Map texture, with red, green and blue for X, Y and Z axes respectively, and a large, friendly +/- sign indicator. I have the .dds too, but you can just make your own. So, since I had to do an airport run today, transport family members to classes and make supper, I'm running a little late today. Actually, I'm surprised I got any work done at all. I decided that a specific light probe component was not exactly what I needed. Because the camera component can render to a texture, it made more sense for the camera to detect when the render target was a cube map and render all six faces itself. The Build tool was getting log output out of order (for example, when the asset compiler called the shader compiler via a system call) - fflush(stdout) in the asset compiler before calling system() seems to fix that. Reworked the way cameras gather / sort game object. Each game object can has a 32-bit mask of layers it belongs to, and each camera can specify which layers it renders to. These were somewhat hard-coded previously, but because I'm using my Very Awesome Attribute File Format to store everything, it was pretty easy to make this data-driven. Added a simple Render Sphere component. Then realized I needed a good way to bind arbitrary shader constants so I can use any effect on the sphere, so built a system to specify any number of textures or shader constants in the attribute file and set them when the sphere is rendered. So, rendering the light probes is almost working - they are currently flickering, which is really odd, and I think I might have some of the axes the wrong way around. Once that is working, I will basically have a reflection map, and I want to try to build a diffuse map using Real-Time Computation of Dynamic Irradiance Environment Maps. Before I do that, I may switch back to working on some of the AI components, considering that I need to make an actual game at some point. 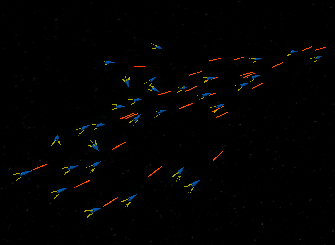 I had a really nifty swarming enemy type working, but I need it to actually shoot something a the player. I have been working on a game (and game engine) since February 2013. I keep a written journal of what I worked on each day, so I'll try to put a quick update on things I worked on today, interesting things I learned or figured out, or just general programming or game development thoughts. I typically try to write something at 6:00pm PST each day, though my family schedule will probably make that highly unreliable. It has been a day of cleaning up some of my build tools and working on some lighting code. I wrote a simple build tool in C# / WPF months ago, but never really got it to "useful" status. I finally patched it up, and now I hit one button and see the color-coded error log of my asset pipeline. The full log is in the top window, and errors/warnings are separated out in the bottom window. I also got my auto-dependency checker working. It has been mostly working for months, but wasn't working recursively (for programs called from other programs) and was failing to account for missing files when doing the dependency check. Seems much better now. It's a pain to debug because it's using API hooking - basically, you "trick" the executable you want to load into replacing a bunch of the standard Windows functions with your own copies. This way, you can monitor what files your tool is trying to access and see if anything has changed the next time you run it. Very cool, a pain to debug.